I may be ordering from you once I get some more dollars anyway :) I sent my boyfriend a link to some of your ties, and he was just pleased as punch with them! i just love these mugs! so lovely!! Very Cute! I love it! Perfect for a morning cup of coffee! oh my, I love this mug! I love this mug!! Too much. Oh, hope I win!! Cute, cute, cute! Count me in! what a lovely mug to have ones morning cuppa in! That is so super pretty! I like this one better than the cats! Wonderful, like everything else you make! You two are too clever, I love this one! well, hey, if it's open to overseas entrants, then i'd really love to win it, it's super-cute! My new apartment could use a fancy mug. ;) Entering! ooo- my monday morning coffee would love to be surrounded by this adorable mug! after your last post, i've decided to give a try to giveways!! this is so cute! hooray for giveaways. adorable! would bring a smile to any gray morning! Mugs are the best. I love this one. I think I love this even more than the kitten one! you know, i've recently come to realize that my favorite color is indeed yellow. for so long i thought it was green. nope. yellow is where it's at. nice use of yellow, anabela! I'm so happy the mugs are back! I bought number 5 (or 7?) back in tha day and it's too pretty! ooh, how exciting! these mugs are gorgeous. oh, hello sunshine is right! this is lovely! Awesome! I adore it. Love the yellow. Lovely! Your stuff is great. i like the addition of yellow!! this is very nice. i also like how you are displaying a bunch of mugs together in a photo i saw recently..
hello sunshine is just so sweet. Aw! What a lovely mug to wake up to in the morning! very pretty! I work at a paint-your-own pottery shop but I rarely see anything this nicely done. i love black, white and yellow. lovely design, lovely drawing. my coffee in the morning would be much lovlier with this mug to accompany it. pick me pick me! heart, i love it. i hope i win. yeye! eek!! my morning coffee cup broke but THIS would be an amazing replacement! i adore the simple line design! beautiful! A coffee drinking experience enhancer for sure. Just lovely! this is beautiful on its own, but even more so knowing it comes from the two of you; so sweet in form and design, so sweet in collaboration, and so nice of you to offer a prize when reading your blog so often is a treat in itself! 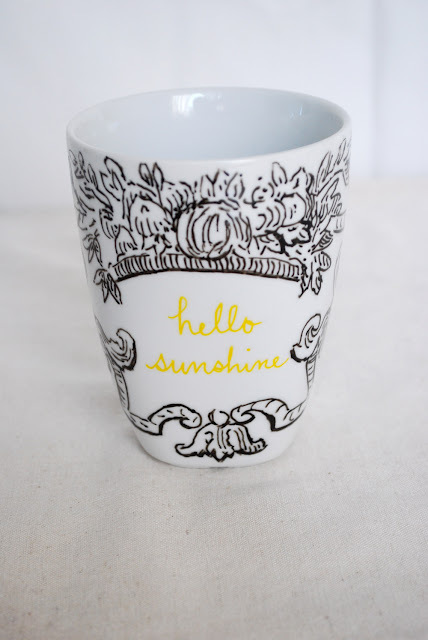 I would love some more sunshine in my life, and a nice place to put my coffee:) Thanks. Oooh, I never win these! But it's beautiful so I'm trying anyway : ) I would love this! lovely mug! who wouldn't want a little sunshine in their day! Hello! The mug is sweet (yellow is my favorite color). I like your blog's nice quiet voice. So awesome! I just started a new job and would love to have a mug like that in my office! 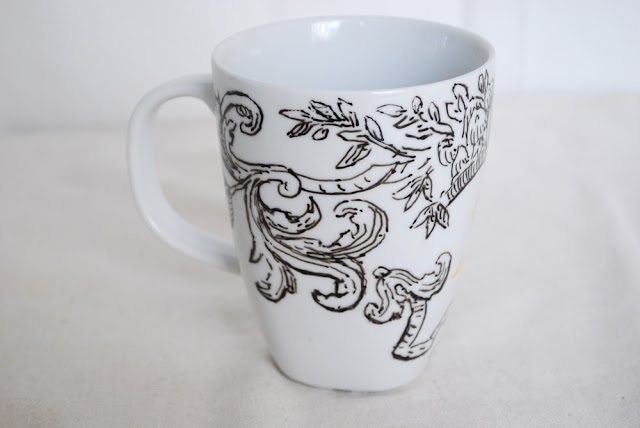 I'm moving into an apartment soon and I'm looking for mugs and other kitchen wear! This would be perfect! i love your style... and would be thrilled to share my mornings with this lil mug. Love this mug and love your blog. I hope I win!! I would love to use this for college! what a lovely mug . . . i think yellow is my current favourite colour! This is amazing. Be mine! oh it's been so long since i've visited your lovely blog anabela! haven't been in the blogging mood! this mug is so pretty!! !